Custom fortune cookies are a yummy way to get YOUR message across. An amazing touch for engagements parties, showers and your special wedding day. 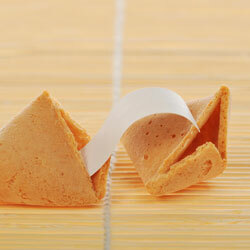 Your custom fortune cookies will be made fresh for you by our baker and come individually packaged in clear cellophane. Interested in adding more customizations to your cookies message, like a photo or graphic, Contact us to learn more. Please fill out all of the required fields below and one of our sales representatives will contact you shortly to go over your QUOTE with you.